The town of Dorrigo is a typical, old, veranda-dominated Aussie bush town, but it was not my destination. I drove through and then headed back to the Rainforest Center in Dorrigo National Park. Glorious mountain views. Simply reaching the park was a treat. This area was first set aside for protection in 1901. 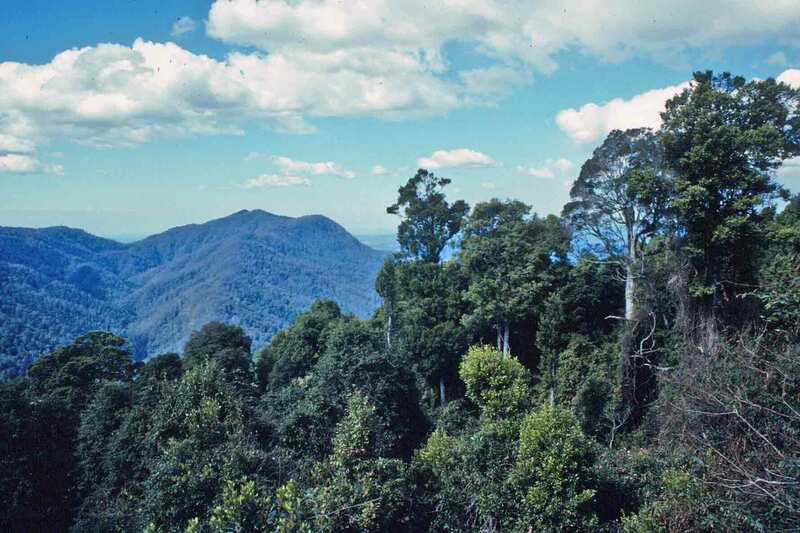 Dorrigo National Park is part of the Gondwana Rainforests of Australia World Heritage Area. The rainforest is both ancient and lush. It’s the sort of place one could probably spend years researching, but happily, they have marked nature walks for those of us with slightly less time than that. As was the case the first time I encountered a sub-tropical rainforest, on my first visit to Australia, so too now, I was delighted beyond words by the beauty that surrounded me. 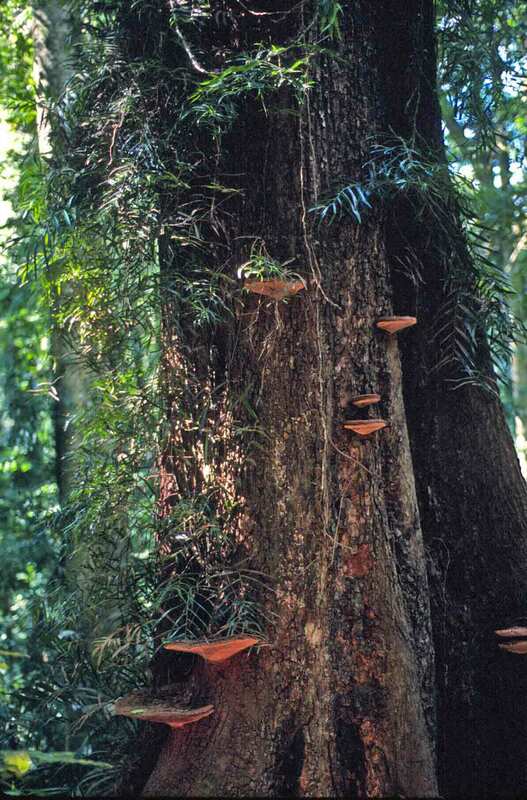 Palms and strangler figs, ferns and mosses, tree bases with buttress roots or covered in shelf fungus, vines and flowers, intense greenery everywhere, layers and layers of green, with small plants growing on larger plants–enclosing, almost overwhelming. Birds everywhere. I hiked through the rainforest for a bit more than an hour. Because this is not a tropical rainforest, it does not have the benefit of permanent heat. The wind turned cold, and it actually sleeted while I was in the rainforest. At least, they called it sleet. Later research turned up the fact that Commonwealth countries are referring to a different type of precipitation than we Yanks are thinking of when we use the word. In the U.S., sleet is freezing rain. Over here, it’s a mix of rain and snow that partly melts as it falls–something like a cross between hail and snow, coming down as little, soft, white spheres. Getting cold and wet was only a minor inconvenience, surrounded as I was with so much beauty, but it was also getting late, so time to head back down the mountain and continue on my way. North, through crowded, commercialized Coffs Harbour, and back to the lonely roads, through fields and forest. Woolgoolga and Corindi, past Grafton, along (and over) the Clarence River. Outside of Grafton, the countryside turns into sort of southern Illinois, but with sugarcane instead of corn. This is the only uninspiring stretch of road so far, but it’s still pleasant: flat land, with some run-down houses, but lush fields of green cane, yards with increasingly exotic flowers, beautiful horses at the scattered stud farms, and the broad, canal-like river to the left, only a few yards away. Back toward the coast, and finally, around 4:30, into Ballina. In the previous post, I mentioned enjoying seeing and hearing the magpies, and it occurs to me that some of my readers will not have heard or seen an Australian magpie. Aussie magpies are not the same birds as Eurasian magpies, but they look similar, with striking black and white feathers. I awoke to the sounds of multitudes of birds. When I stepped out onto my private patio, overlooking the lily pond, I noticed the swimming pool nearby, and was just a little sorry that my short stay and the still-cool weather precluded taking advantage of it. Instead, I filled my canteen (nice to have in the car on long drives) and packed the car. And so, in brilliant sunlight, accompanied by the laughter of kookaburras, I set off again, ever northward. I turned left just past Urunga and found myself surrounded by the incredibly beautiful ranch land and meandering waterways of the Bellinger Valley, with a backdrop of green mountains beyond the green fields and stands of trees. Before long, I pulled into the wonderful town of Bellingen. Between the charming antiquity of the town and spectacular setting, I could easily imagine myself living here. Charming is a big part of what folks come here for. Clustered along the banks of the Bellinger River and bisected by a road named Waterfall Way, the little town offers 100-year-old buildings, arts and crafts outlets, and coffee shops and gourmet eateries. In other words, I’m not the first person to have stopped in and found this place desirable. I spent about an hour and a half hiking around town, admiring the lovely, old buildings and fun shops. 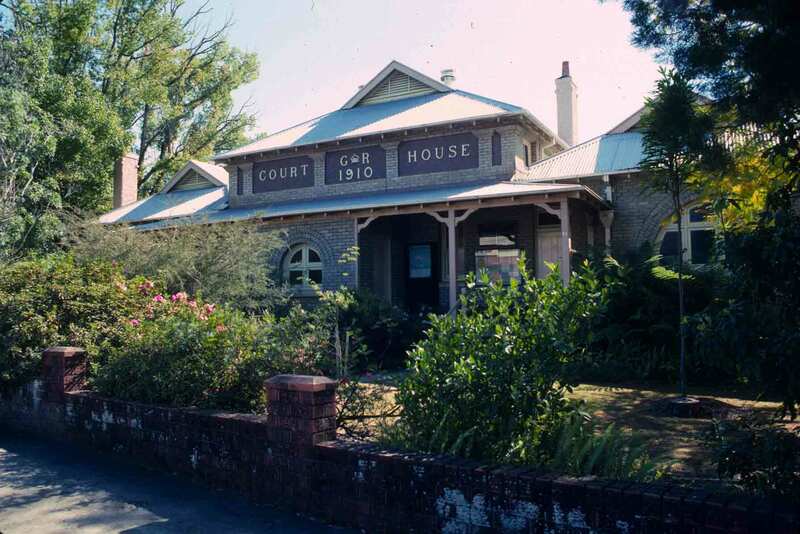 The Bellingen Courthouse was built in 1910. However, this is still a working courthouse, not a tourist stop, so I just photographed the outside and continued on. The Old Butter Factory, built in the 1920s, was fun for its history, architecture, and charming craft shops. I’m not here to shop, so I simply admired the architecture of the old Hammond & Wheatley Emporium, a general store built in 1900 and now repurposed as a clothing store. More delightful architecture, B&Bs, cafés, and I easily accumulated a few dozen photos. As much as I loved the town, I also loved the surroundings. The general green beauty was restful and exciting at the same time. There were a lot of magpies, which pleased me, as I’ve always enjoyed their delightfully musical song. But soon it was time to move on, heading for Dorrigo. Then it was back in the car, to try to “beat the sun.” I wanted to reach Nambucca Heads before it was totally dark. I just made it, pulling in at the Destiny Motor Inn just as the afterglow began to fade from the sky. Of course, just as the motel is a bit more flash, so is the dinner menu. I had lamb loin stuffed with spinach and macadamia nuts. Almost ordered the whole baby barramundi with lime, ginger, and chive sauce. They also offered a pair of quails and a smoked venison platter among the evening’s half-dozen specials. Pretty impressive. But then I’ve always thought of Australia as an excellent dining destination. They had a fire in the fireplace, since the evening is chilly. The hostess was charming and friendly, and as has happened often during my travels in Australia, she stopped to chat. She was originally from Sydney, but she likes living out in the country better. There were not a lot of guests, which is a shame, since everything was so nice: cloth napkins, a bouquet of herbs and fresh flowers on the plate, the crackling fire. In fact, there was only one other couple. I’m always sad when any business is not doing well, but especially when it’s a really lovely operation, like this. But it is not the busy season, so I’ll hope that they do better at other times. I had brought John Steinbeck’s Travels with Charley along on the trip, to have something to read in the evenings. It’s the perfect book to read during a road trip. It is true, as Steinbeck notes in the book, that every journey has its own personality. Maybe that is why my heart only half recognizes where I am. This trip is so different from the previous one that it’s taking me a while to get to know it, to really feel like I’m back. It is like seeing the face of someone related to a cherished friend–partly but not entirely familiar. But the face is still beautiful, and loved. I wandered through the museum, which outlines the prison’s history. It started life as a Public Works Prison opened in 1886. 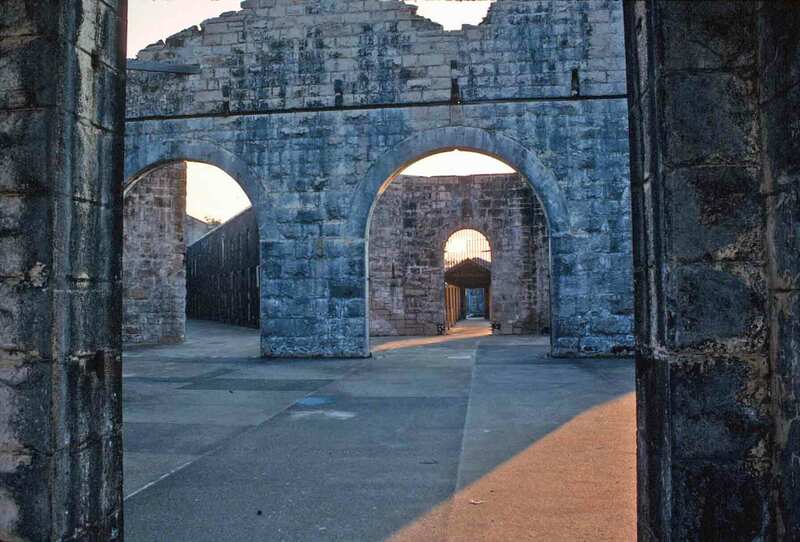 It was an experimental prison, one that tried to reform inmates through work. It was believed that humane treatment would be more effective in redeeming the criminally inclined. The original prison took 13 years to build, which I imagine had as much to do with its isolation as with its impressively sturdy stone construction. 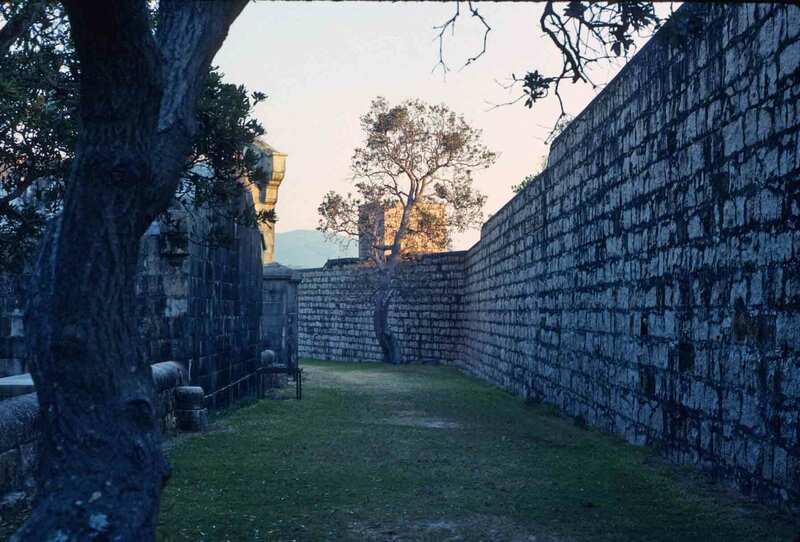 It was a fairly extensive complex of buildings, as it would have to not only house but feed and care for the inmates and guards who lived there. It would be home to prisoners who would be doing public works–in this case, building a breakwater on the nearby bay. Despite the presence of a prison, the bay was not named for a day in court, but rather for a ship named Trial that was wrecked there in 1816. (Interestingly, the ship, a brig, had been stolen by a group of convicts, so the name of the ship suited those sailing it when it sank.) The ship was found in 1817, and because there was no sign of survivors, it was assumed that everyone, convicts and hostages, must have perished. It was actually the consistency with which ships were wrecked in this area that led to the attempted building of the breakwater, though that didn’t really work out as hoped. The jail was expanded in 1900s, and electric lights were added. However, climbing expenses and violent storms combined to derail the breakwater project far short of its intended length. In 1903, the jail was closed, and in 1904, it was auctioned off. Then, during World War I, it was needed again, as an Enemy Alien Internment Camp–a place to keep any Germans or Austrians who were feared to be enemy sympathizers. Finally, in 1922, everything that could easily be removed was taken, leaving only the haunting ruins that are now designated a heritage site. I hiked around the ruins for about 40 minutes. The buildings were impressive, and I took a fair number of photos. I also chatted for a while with the woman who operates the museum. She was worried about the wild wind that was whipping the coast today. She said it normally doesn’t get windy until well into summer, and this is still winter. Also, she said it’s getting warm early, and it was unusual to have no clouds. Since she lives in the forest nearby, the dry weather and winds have her a bit worried, as fire can sweep through quickly in these conditions. Kempsey, perched on the Macleay River, is the approximate halfway point between Sydney and Brisbane. But that’s not why I stopped. Kempsey is also a kind of a gateway to a fair number of splendid parks and scenic coastal areas, and there is a tourist information office and historical museum in South Kempsey Park. I picked up information and a few maps of the area, and then turned east and headed for Hat Head National Park. The drive to the coast was fascinating, through an ever-changing landscape that included forest, scrub–and fire. It has been a dry winter, and I’ve seen them burning off undergrowth at a number of spots along my drive. This controlled burning helps prevent major fires. However, this time I was in the middle of it. I passed through clouds of smoke and past occasionally leaping flames. I was surprised to note that I could actually feel the heat through the car door. (I suspect that if I’d mentioned to anyone I was coming this way, they would have suggested an alternative route, if one exists–but it hadn’t occurred to me to mention it.) Having spent a number of years in Southern California, where I experienced a few major forest fires, I didn’t find the widespread but fairly low-key brush fire disconcerting. So, through the fire I went, continuing on to the coast. 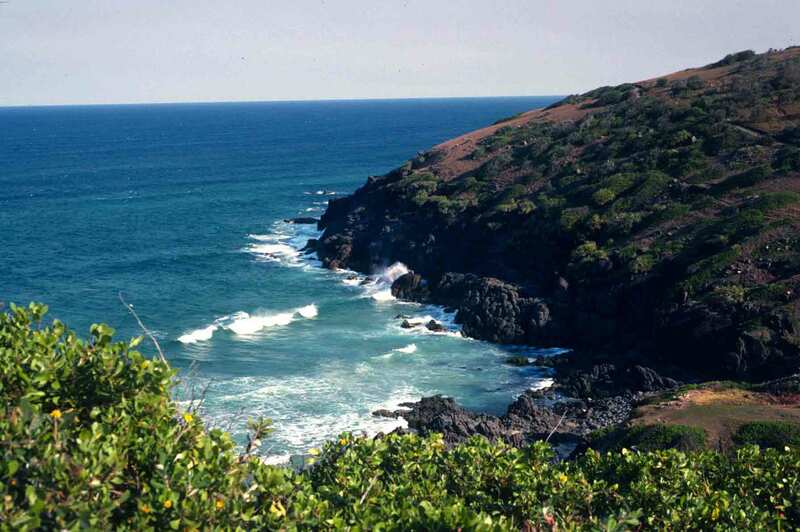 Hat Head National Park is known for its sprawling, live dune system, wetlands, wildflowers, hiking trails, long beaches, pockets of rainforest, great bird watching, and seaside cliffs. I was determined to fit as much of that as I could into the few hours I had. So out of the car, and off on foot. Hat Head is gorgeous. Green water crashed against craggy cliffs that reminded me a bit of Cornwall in England, except for the vegetation. There was no one else anywhere, as far as I could tell, so the only sounds were birds, breeze, and waves. Wonderful. I hiked for an hour and a half down a rugged, rocky trail, out along the coast to Hat Head Point. Down to the shore and then up another trail that took me to the tops of the cliffs. 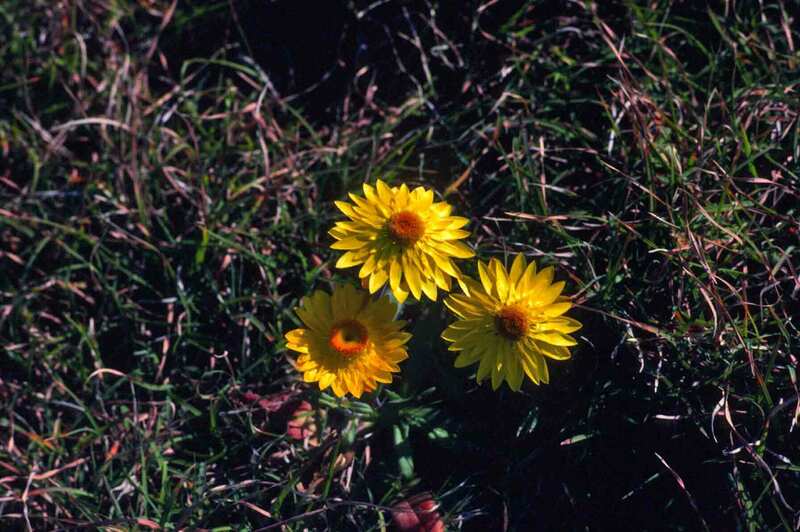 I photographed wildflowers–banksias, everlastings, pimelias–as well as nearly every great rock or excellent coastal view. At one point, as I made my way up a narrow trail that dropped off quickly to my right, something flashed across my path. Probably a lizard, but my first thought was snake. This made me jump back, and, on the loose, rocky path, I slipped and crashed down on one knee. It was not a serious injury — a bit of blood, and the bruising will be unattractive — but it offered a serious jolt of reality. I’m inches away from a cliff. There is no one else here. No one knows I’m here. It’s unlikely anyone else would blithely drive through a brush fire to get here. I need to be a little less casual about this. And a little less hurried in my effort to see everything. I descended the cliff-side trail a little more cautiously than I had ascended it, then strolled over to an inlet bordered by sand, which led in turn to a delightfully weird forest of pale, short, twisted gum trees. Smoke rising in the distance reminded me that I would have to pass again through the brush fire, to get out of here — plus I still had another stop before day’s end. So I finally returned to the car and headed back out of the park and toward the highway. I am not a morning person. My energy levels are always higher at night, and I normally have to struggle to get to bed by midnight. However, a really long time in an airplane combined with crossing more than a dozen time zones has rendered my regular rhythms seriously disrupted. As a result, I have clearly convinced my night-owl body that early to bed and early to rise is actually a possibility. I was not only awake but up and perky at 6:15 am. I know this won’t last, but it’s convenient now, as it will enable me to make the most of daylight hours. At 7 am, my breakfast tray was delivered, and after a break for tea, fruit, and cereal, I finished dressing and repacking. I was checked out and ready to depart by 8 am. It is an unbelievably beautiful morning, sun shining, mist rising from the mountains, a cool breeze blowing, and a few wispy, white clouds overhead. And back to the road. Actually, staying on the left isn’t the hardest part of driving here. It’s all the little reflex things that trip you up: glancing in the rear view mirror or side mirror, using the turn signal, reaching for the gearshift. I’m on the right side of the car, so everything is backwards. I wash the windshield almost every time I want to make a turn or change lanes. I got off the Princes Highway and turned onto the Lakes Way, through Myall Lakes National Park. It was a fabulously beautiful drive. Fingers of light reached between the trees, dappling the road, as I wound through the forested mountains before descending to the shores of the Myall Lakes. I stopped a few times to shoot photos and admire my surroundings. It was incredibly peaceful, with rare and only momentary disruption when a car passed. I could hear kookaburras, a bellbird (I think), the ha ha haaa of Australian crows (which always sound more mocking than crows elsewhere), and several other birds I could not identify. As I continued north, the landscape flattened out. The vegetation changed dramatically as I left the mountains behind. 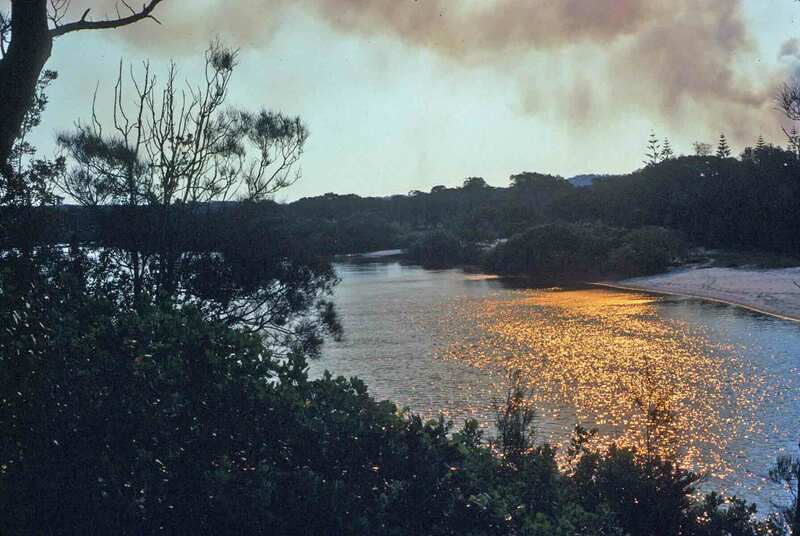 Sand replaced soil and lower coastal vegetation replaced the gum forests. As I neared Forester, I caught glimpses of the sea. Crossed from Forester to Toncurry on a bridge over a startlingly turquoise-blue stretch of water. I’m now seeing a lot more “up north” vegetation: Coral trees, palms, hibiscus, etc. Crossed a bridge over the Manning River into Taree. In Taree, a block past the river, I saw a sign for Solomon’s Fruit Market. I stopped and browsed the splendid offerings, settling at last on Granny Smith apples (Granny Smith was an Aussie, you know), ladyfinger bananas, and mandarins. Then I walked over and photographed the river. It’s getting quite hot out. I knew it would get warmer as I headed north, but it’s still winter, and I’m still fairly far south. It’s a pleasant surprise. Legs stretched out, photos taken, and some of the fruit consumed, I got back on the road. It was about two more hours before my next stop: Kempsey.